This month, I’ve been trying to work out a plan for some stunning guipure lace I found last winter. My dear friend Steph and I have challenged ourselves to making guipure lace dresses for the final opera in our season subscription in February. The first task, finding just the right color of silk charmeuse to use as a foundation for the dress, took over 8 months. I did manage to find the winning combination at the end of an action-packed business trip to New York in the fall. When I bought the lace, I had in mind a simple sheath dress, or maybe a sheath with cap sleeves. But earlier this month when I was on the El, I saw a young woman wearing a pretty embroidered lace dress with a full skirt and it made me reconsider the silhouette. My sketching skills absolutely do not do these fabrics any justice, but here goes. Then I wondered whether a high boat neck in the front and a dip in the back might be appealing. Then I thought about the weight of the lace and decided it would be better to reign in the fullness of the skirt. Something like this. The next thought that popped into my head was managing the zipper. That will require a review of Susan Khaljie’s Craftsy class on the guipure lace skirt. Then it will be time to get to work on the pattern and mock-up! I’ve really missed blogging, but I’ve learned I have to accept that there are just so many things I can stuff into a day and sometimes work and Life simply demand all of my time and energy. It’s not that I haven’t been sewing at all recently, but I have had some misadventures in sewing. More about that in a minute. For now, I’d like to share my latest completed project. It’s the tucked linen top that was inspired by the workshop with Mary Ray that I took through ASG Chicago in January. You may remember this fabric combination from my post about my complicated relationship with color. This top is almost what I had planned. I sprayed a bit of Mary Ellen’s Best Press on the linen and pressed in a crease, then stitched at ¼” using my blind hem foot. It’s had to tell on from these pictures, but the tuck that goes all the way across the front panel just below the neckline is drawn in the pattern and trued at the princess seams. I was all set to make a neck facing, but Sarah Veblen suggested I line the top in washed China silk, which I did. I also made faced hems for the bodice and sleeves, because I’ve had a problem with linen blouses “cracking” at the hem. It’s this curling thing that happens and no matter how many times you press the darn thing it rolls up again like a window shade. Very annoying! Faced hems are the way to avoid that problem. For the sleeves, I wanted to convert my usual two-piece sleeve to a one-piece sleeve so I could have a tuck that is not interrupted by a seam (and the problem of getting it to match). Here is the sketch of the design, which I posted several months ago. On me, a one-piece sleeve that’s not a knit requires the tucks you see in the picture because of all the excess fabric in the sleeve cap. I was in a tizzy when I got to the sleeves and didn’t pay attention to lining up the sleeve tucks with the blouse tucks, even though that’s the way Sarah draped the sleeve muslin on me. As you can see, I got one side right. Dumb luck! In the course of this project, I tried to avoid this whole tucks in the sleeve cap issue by developing a sleeve with a crescent-shaped inset at the top, using Sarah’s instructions in Threads Magazine (Vo.192, Sep. 2017 pp.44-45). The mock-up showed me this is a design that does not work on me. Sigh. But that’s not the only reason I was in a tizzy when I set in the sleeves. The other reason is that I completely forgot to put the tuck in the fabric before I cut out the sleeve. That’s why there is no tuck across the sleeve in the pictures. Another sigh. And a head shake. One of these just might work. I’m crazy about the skirt. It’s rayon challis from Stone Mountain & Daughter Fabrics. I took my master pattern for a pencil skirt, which is a six-panel princess and extended each of the seams to make the skirt swishy. Originally, this skirt was going to be cut on the bias. That was another misadventure I had this summer. The wearable mock-up I made out of another rayon challis was absolutely not wearable. It looked adorable when I tried it on right after I sewed it, but when I left it hanging on my dress form so I could let it relax before hemming, it developed some nasty waves and pouched out in all the wrong places. The lesson from this is that bias does not play well with seams shaped to fit my curves. So, I went back to the drawing board for bias. I have to come up with something for the ASG Chicago Chapter Fashion Show next month, because the Sew Chicago Neighborhood Group Challenge is “Show Your Bias.” I’m working on Plan B this week. Meanwhile, I have a fun new swishy skirt on the straight of grain and at least another week of warm weather to wear it with my linen top. It’s pretty obvious to anyone who reads this blog or has known me for any length of time that I gravitate toward a muted color palette. A few years back I treated myself to a color analysis. Afterwards, I was reminded of something the organization development guru Peter Block said in a lecture: Most people go to therapy, not to change, but hoping they will get confirmation. The result of my color analysis was definitely confirmation. I get a lot of unsolicited advice about branching out to more vibrant colors. Much of this leaves me grumbling about “the color police” and wondering why it matters to people I barely know what I choose to wear. It’s different when I ask for an opinion. Or at least I think so. It’s been just over a year since I attended Sarah Veblen’s six-day workshop, Exploring Fashion Design: Design 1. That was a wonderful, but difficult experience for me. I was full of anxiety going in and I reached anxiety overload mid-way through the week. What got to me most wasn’t the stuff I was concerned about before I started (which was sketching and developing a personal croquis with everyone weighing in on the process). Instead, it was the exercises having to do with putting colors together. I just don’t feel I do it well and I’m amazed when other sewists combine colors, patterns and textures with great results. This is the sort of thing that, in the wrong hands can go horribly wrong and I’m convinced that any attempt I make at it will fall into that second category. These were the top three swatches once everyone looked them draped over my blouse so they could see them close to my face. (I can’t find that picture. Sorry.) At my request, Sarah and the class ranked them in order of preference so I could use them as a guide. Since then I’ve bought fabrics in that general color – and sometimes beyond – but I’ve yet to do anything with them. I have plans for this lovely cotton I bought from Louise Cutting’s Cutting Line Designs last summer at the ASG National Conference (bottom center in the picture). I know I want to make another “campish” shirt out of it, but I didn’t get to it last summer. I’m hoping I’l get to it this summer. This subject came into focus recently when I was working on a linen blouse to go with a bias skirt I’m going to make out of this pretty rayon challis from Stone Mountain & Daughter. The bright colors and high contrast are definitely unusual for me, but when it came to a color to wear near my face, I reverted to my usual blue. Unfortunately, I discovered some flaws in the blue linen when I was pressing it before sewing. There are streaks and little splotches that are quite a bit lighter than the rest of the fabric, as if the dye didn’t “take” in this spots. It isn’t a question of fading, because the swatch I tested and retested in very hot water and with a hot iron remained colorfast. I looked at the rest of the blouse-weight linen I have, but I felt that none of them would work as well. You know how you just get an image in your head for a project and can’t let it go? So, I took a risk and laid out my pattern pieces to avoid the problem areas, or so I thought. After pre-tucking in the places that needed it, cutting everything out and putting in the final tuck, I started to assemble. In my next pressing, I noticed another streak. That started a search for another linen I could be excited about for this skirt. Of course, getting the right color online is a tricky proposition. Not everyone goes to the trouble of giving us Pantone colors the way Linda Podietz does on her site, EmmaOneSock.com (thank you Linda!). The result is that I now have an extra supply of linen for future projects. All are very nice, but none of the blues sang out to me. It was the disappointment over the one that didn’t work out, I’m sure, because this one is perfectly fine. But you can see that it’s darker than the fabric I wanted to use. So I tried branching out into the coral area. At first I thought a bright coral might work because the flowers in the skirt are bright, but that didn’t quite cut it. Besides, it’s a medium weight and more suited to a jacket. Then I found this cross-dye linen in just the right weight. This was my Goldilocks moment. I can’t wait to cut into both of these fabrics and get this project back on track. 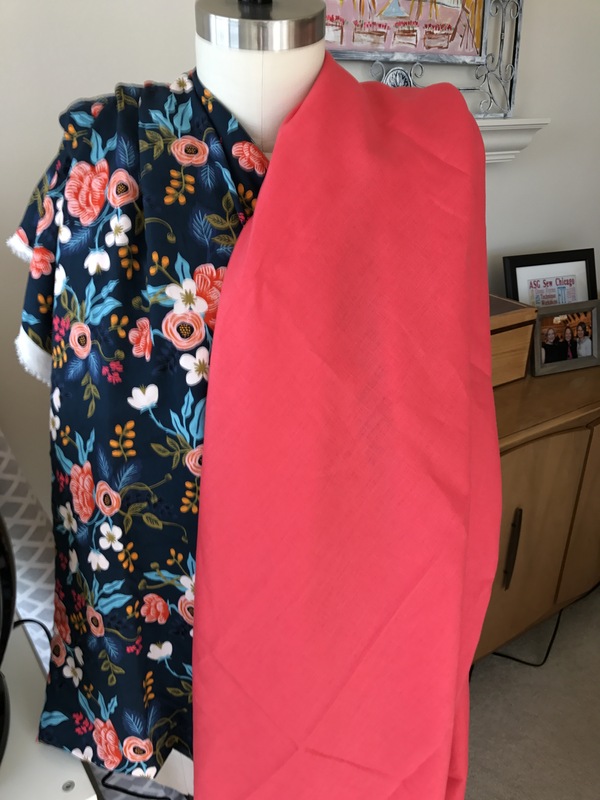 It’s been way too long since I’ve posted on this blog and it seems like forever since I’ve finished a garment to blog about. So, let’s get down to business with the jacket that I was going to wear on a trip to Brazil that has since been cancelled. Except for the wrinkles, you would never know that this is linen. It has the look and texture of wool. The fabric is Armani (it says so in the selvage), which I bought from Marcy Titlon’s web site possibly two years ago. The pattern is one of those things that’s hard for cameras to capture accurately. It’s tiny houndstooth checks in black, taupe and beige. The buttons are from Soutache Ribbons and Trim and it is lined in Bemberg Ambiance. I started with my basic armscye princess bodice and ¾ length two-piece sleeves. I knew I wanted to do a Mandarin collar and at first I thought I might want the jacket to be asymmetrical, similar to this sketch I had made earlier (the one on the left). After looking at circles of paper the size of my buttons arranged on my dress form, I decided to drop the idea of asymmetry. Having the buttons at center front looked just fine. I also decided I didn’t need the curve in the front overlap/underlap and cuffs or buttons on the sleeves could be eliminated as well. Work had been getting increasingly busy and I needed to get this project done. In a mentoring session, Sarah Veblen told me I could just mock up the collar once I got the body of the jacket constructed, but I was unsure about the neckline so I did a muslin of a part of the front, the back and the collar. Sarah made minor adjustments to the mockup during a You Choose Your Focus workshop here in Chicago in March. Her advice was to make the collar slightly shorter in the front, which I did. The next issue I thought through was the button in the collar. I knew that trying for a functional buttonhole and button in that location was asking for trouble, particularly with the diminished amount of real estate that resulted from making the front of the collar dipping a bit lower than the rest of the collar. I knew a plastic snap behind a button would work, but that still meant taking a risk of running into all sorts of headaches with the buttonhole. My solution was to make the top buttonhole before assembling and attaching the collar. That gave the automatic buttonhole foot an unobstructed path to work with. The stitching is on the upper collar only and I never cut it open. I made several practice buttonholes, both before making the non-functioning one and before making the rest of them, just to make sure that nothing had shifted when I set the buttonhole foot aside to sew the rest of the jacket and to account for the differences between a single layer of fabric and a fashion fabric/interfaced facing sandwich with a seam connecting them. Except for some skipped stitches that had to be resewn by hand, that part of the process worked fine. For this project, I made a complete checklist of all the construction steps in advance in an attempt to keep myself on track and help with time estimates. This is one of the suggestions Sarah has made to help me be more realistic about my expectations and chart my progress. Checklists, like shopping lists, are extremely helpful, but only if you read them! I was working merrily along without referring to my checklist when I realized that I worked the collar construction the way I do a rolled collar, assembling it before attaching it to the body, whereas I had wanted to use the method you use for a collar band on a tailored shirt. I caught my mistake too late and complained to Sarah that I was going to have to make a new collar. She pointed out that there is more than one way to approach this construction and, in fact, she never uses the tailored shirt method. I followed her advice and concluded that, for a lined jacket, both methods work just fine. The other side was perfectly smooth. Sarah tried to diagnose the problem by looking at pictures of what was going on inside. After repeated pressings, extra clipping of the curve and general futzing, I remembered that I had needed to resort to spot steaming and some easing when sewing the neck seam. In all likelihood, one side got stretched out of shape in that process. Probably nobody would have noticed had I not pointed it out here, but I think it’s important to go over the pitfalls so we all can learn from them. Anyway, that close-up does show you my nice fake buttonhole. The jacket is finally in my closet, and I might actually wear it if (1) I get the black linen skirt that goes with it sewn (right now all the pieces are cut out and only the back darts are sewn); and (2) I have a meeting that does not involve a video conference component (there is a reason nobody wears houndstooth prints on TV) on a day when the dew point isn’t in the stratosphere. Is that asking too much?